Sourdough bread is an old favorite that has recently risen in popularity. Many people consider it to be tastier and healthier than conventional bread. Some even say that it’s easier to digest and less likely to spike your blood sugar. But is there any truth to these claims? This article takes a close look at the evidence. Sourdough is one of the oldest forms of grain fermentation. It’s believed to have originated in ancient Egypt around 1,500 BC and remained the customary form of bread leavening until baker’s yeast replaced it a few centuries ago (1). A leavened bread is a bread whose dough rises during the bread-making process, usually as a result of gas being produced as the grain ferments. Most leavened breads use commercial baker’s yeast to help the dough rise. However, traditional sourdough fermentation relies on “wild yeast” and lactic acid bacteria that are naturally present in flour to leaven the bread. Wild yeast is more resistant to acidic conditions than baker’s yeast. This is what allows it to work together with lactic acid-producing bacteria to help the dough rise. Lactic acid bacteria can be found in several other fermented foots, including yogurt, kefir, pickles, sauerkraut and kimchi. The mix of wild yeast, lactic acid bacteria, flour and water used to make sourdough bread is called a “starter.” During the bread-making process, the starter ferments the sugars in the dough, helping the bread rise and acquire its characteristic taste. Sourdough bread takes much longer to ferment and rise than other types of bread, which is what creates its particular texture. To this day, making sourdough bread remains popular in Mediterranean and Middle Eastern countries, as well as in the San Francisco Bay region of the US. Summary: Sourdough is an old form of bread leavening. It relies on a mix of wild yeast and lactic acid bacteria that are naturally present in flour, rather than baker’s yeast, to leaven the dough. The nutrition composition of sourdough bread depends on the type of flour used to make it — whether it’s whole grain or refined. Nevertheless, sourdough’s nutrition profile resembles that of most other breads. In addition, sourdough has some special properties that allow it to surpass the nutrition profile of most other types of bread, which is discussed in the next chapter. Summary: Sourdough’s basic nutrition profile resembles that of other breads, but it has a few special properties that make it more nutritious. Although sourdough bread is often made from the same flour as other types of bread, the fermentation process improves its nutrition profile in several ways. For starters, whole grain breads contain a good amount of minerals, including potassium, phosphate, magnesium and zinc (3). Unfortunately, the absorption of these minerals is limited by the presence of phytic acid, which is commonly referred to as phytate. Phytates are considered antinutrients because they bind to minerals, reducing your body’s ability to absorb them (3). Interestingly, the lactic acid bacteria found in sourdough bread lower the bread’s pH, which helps degrade phytates. This results in a bread that has a much lower phytate content than other types of bread (4). One study showed that sourdough fermentation may reduce the phytate content of bread by 24–50% more than conventional yeast fermentation (5). Lower phytate levels increase mineral absorption, which is one of the ways in which sourdough bread is more nutritious than conventional bread. Moreover, studies show that the lactic acid bacteria present in sourdough bread have the ability to release antioxidants during sourdough fermentation (6, 7, 8). Sourdough fermentation also increases folate levels in the bread, although levels of certain nutrients like vitamin E may be slightly reduced in the process (3). Finally, sourdough’s longer fermentation time helps improve the flavor and texture of whole grain bread. This may make people more likely to opt for a whole grain bread, thereby promoting a higher consumption of fiber and nutrient-rich breads (4). Summary: Sourdough bread contains higher levels of folate and antioxidants than other breads. Also, its lower phytate levels allow your body to absorb the nutrients it contains more easily. Sourdough bread is often easier to digest than bread that’s fermented with brewer’s yeast. Researchers believe this could partly be due to sourdough bread’s prebiotic content and probiotic-like properties (1). Prebiotics are non-digestible fibers that feed the beneficial bacteria in your gut, while probiotics are beneficial bacteria found in certain foods and supplements. Regularly consuming both may help improve your gut health, easing digestion (9). Sourdough fermentation may also help improve digestion by degrading gluten to a greater extent than baker’s yeast (10). Gluten is a type of protein found in certain grains. It can cause digestive problems in people who are sensitive or allergic to it (3). Gluten tolerance varies from person to person. Some have no visible issues digesting gluten, whereas it can cause stomach pain, bloating, diarrhea or constipation in others (11). Sourdough bread’s lower gluten content may make it easier to digest, especially for individuals sensitive to gluten. Research has shown that the sourdough fermentation process may also help improve the taste, texture and nutrient availability of gluten-free bread (1, 4). This makes gluten-free sourdough bread an interesting alternative for those needing to avoid all gluten, such as those with celiac disease. Summary: Sourdough bread contains lower amounts of gluten, making it easier to digest for people with gluten intolerance. Its prebiotic and probiotic-like properties may further improve digestion. 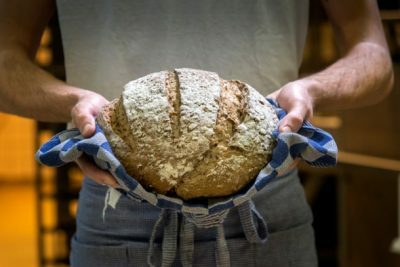 Sourdough bread may have a better effect on blood sugar and insulin levels than other types of bread, though the reason for this isn’t yet fully understood. Researchers believe that sourdough fermentation may modify the structure of carb molecules. This reduces the bread’s glycemic index (GI) and slows down the speed at which sugars enter the bloodstream (12, 13, 14, 15, 16). The GI is a measure of how a food affects blood sugar. Foods with a lower GI are less likely to produce a spike in blood sugar levels. In addition, the lactic acid bacteria found in the dough produce organic acids during fermentation. Some researchers believe these acids may help delay stomach emptying and prevent a spike in blood sugar in a way similar to vinegar (4, 17). The sourdough fermentation process is often used to make rye breads, as rye does not contain enough gluten for baker’s yeast to work effectively (1). One study showed that participants who consumed rye bread had a lower spike in insulin levels than those given the same amount of conventional wheat bread (18). In addition, several other studies compared participants’ glucose response after eating sourdough bread and bread fermented with baker’s yeast. Overall, participants who ate the sourdough bread had lower blood sugar and insulin levels than those who ate the breads fermented with baker’s yeast (19, 20, 21, 22). Summary: Sourdough fermentation produces changes in the bread that may allow for better blood sugar control and improved insulin sensitivity. Fresh sourdough bread can be made at home from three simple ingredients — water, flour and salt. Make a sourdough starter. You can learn about making one in this video. Feed your starter daily and let it grow for a few days. You will use part of this starter to make the bread and save the rest for future use. Mix part of your starter with flour and water and allow this mixture to rest for a few hours. Then add salt. Fold the dough a few times before letting it rest again for approximately 10–30 minutes. Repeat the folding and resting steps a few times until the dough becomes smooth and stretchy. On the final rest, let the dough rise at room temperature until it grows to about 1.5 times its original volume. Shape your bread loaf and bake it in a Dutch oven. Allow bread to cool on a rack for 2–3 hours before slicing it. For a complete video about how to use your starter to make a loaf of bread, check out this video. 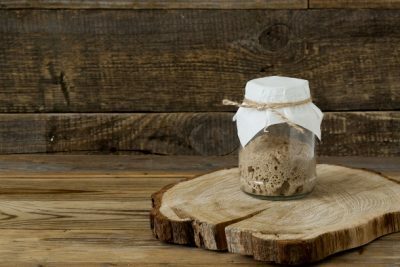 Keep in mind that making your sourdough starter will take approximately 3–5 days. Do not rush this process, as the quality of your starter is what will give your dough a good flavor and help it rise. Also, note that you will only use part of the starter to make the bread. You can save the rest for future use as long as you refrigerate it and “feed it” at least once a week. When you’re ready to make another loaf, simply take your starter out of the fridge 1–3 days ahead of time and feed it once a day until it strengthens again. Summary: Follow the steps above to make your sourdough starter and first loaf of bread. There are many more recipes available, as well. Sourdough bread is a great alternative to conventional bread. Its lower gluten and phytate levels make it more nutritious and easier to digest. Sourdough bread also seems less likely to spike your blood sugar levels, which makes it an option for those monitoring their blood sugar. All things considered, it’s worth giving it a try. Just remember that sourdough bread can be made from virtually any type of flour, so opt for a whole grain variety.